I believe that is actually the Emperor, not Horus. And i know Mordheimer from 40k online 😀 Mordheimer remember me? you’ve got to remember, Horus was badly beaten by Sanguinius, the Blood Angels Primarch, and he still managed to cripple the Emperor beond reprive. So i rekon if Sanguinius hadn’t fought Horus, the Emperor would be dead. have that you imperialist lapdogs. No, Horus was not badly beaten by Sanguinius. Infact, Sanguinius; as much as he is an amazing primarch, was no match for Horus, as he had been weakend when taken by suprise by Ka’bandah The greatest Bloodthirster. Although after a bit of a fight, he managed to defeat him, he still very weakend. He was no match for Horus by now, and when he reached him, Horus strangled him to death. Darkness: The Emperor is kept alive by the machines of the Golden Throne. The chorus of psykers who are consumed are actually used by the Emperor to power the Astronomican. And another thing, Horus only badly crippled The Emperor because The Emperor refused to retaliate at first, for he still did not fully belive his favourite son had gone chaos, then when he was attacked a few tmes, he realised and attacked back. DEATH TO THE CHAOS GODS. THE EMPEROR RULES. THAT IS HIM. ANSWER THE CALL, BROTHERS OF THE BLOOD!! guillimans greatest son: I don’t want to disagree with what your GUT is telling you about this image, but there is no doubt that it is the Emperor. 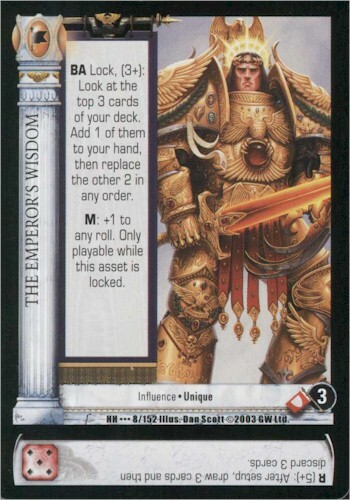 In fact, it is drawn by artist Dan Scott, is from the Horus Heresy collectible card game, and is called the Emperor’s Wisdom. Meh, Mark Gibbons was always my favourite WH40K illustrator. Horus was Bald. This is the Emperor. That is a golden powerfist. That is a native american with some tin foil on. It is most definetly not from any game. At all.